Under 4 pounds isn’t racer light, but for a travel/touring bike with S & S couplings and Paragon dropouts, that’s really good. 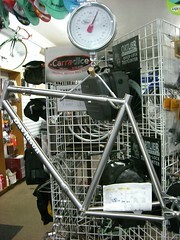 Total bike weight in Single Speed Mode is under 18 pounds. I’ll post the details of the built bike in another ready-to-ride post.